Although Windows 10 is jam packed with options to customize your user experience 10 Quick Ways to Customize & Personalize Windows 10 10 Quick Ways to Customize & Personalize Windows 10 Not all of Windows 10's default settings will float your boat. We show you all the possible ways to customize Windows 10 in a simple, step-by-step guide. Read More , some features are often disregarded by most users. 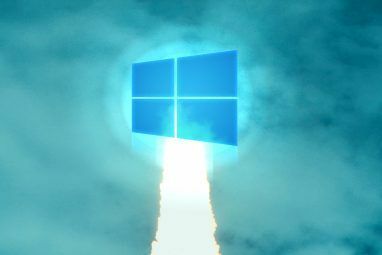 The Windows 10 Start Menu The History of the Windows Start Menu The History of the Windows Start Menu For all the pomp and ceremony surrounding the release of Windows 10, one of the most well-received features of the operating system is the return of an old friend—the Start Menu. Read More — designed to incorporate certain features of the previous Windows 8 metro theme — is a perfect example; the new Windows Start Menu incorporates tile and program fencing features Turn Your Windows Desktop From Cluttered To Useful For Free With Fences Turn Your Windows Desktop From Cluttered To Useful For Free With Fences I'd like to start this post with a small request: Hit Win+D for me. I'll wait here. Go ahead, do it. Okay, done? What did you see? Was it a hot mess of cluttered icons... Read More , which all too often go unnoticed. With our helpful tips, you can turn your plain Windows 10 Start Menu into a crisp and beautiful command console! 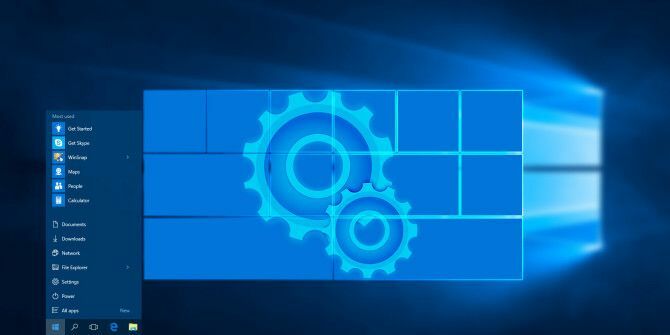 Some of the best customizing features of the Start Menu are already present in the system settings A Guide to the Windows 10 Start Menu A Guide to the Windows 10 Start Menu Windows 10 fixes the Start Menu dilemma! Getting to grips with the new Start Menu will supercharge your Windows 10 experience. With this handy guide, you'll be an expert in no time. Read More . Before jumping into tile customization, let’s go over a few easy changes. Default Start Menu settings can be found under Start > Settings > Personalization > Start. Some of these settings, such as Use Start full screen, are great options, if you are using a Windows 10 tablet. There is also a Show more icons option, which increases the amount of programs you can add to a fence’s row from 3x to 4x medium tile spaces. If you’re annoyed by how often you have to open File Explorer to access your Downloads folder, click on the Choose which folders appear on Start option to add certain folders directly onto your Start Menu. If you’d like to add tiles to your Start Menu, right-click on any program and select Pin to Start. Once a program is added to the Start Menu, you can resize the icon by right-clicking the tile selecting Resize. Programs like weather applications downloaded through the Windows Store even have built-in live tile features. 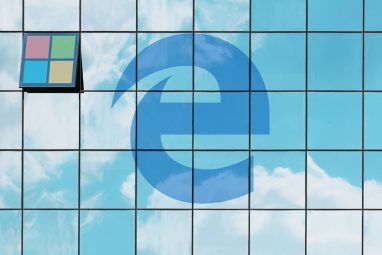 Chrome applications and universal windows applications can be added to the Start Menu 6 Ways to Hack & Customize the Windows 10 Start Menu 6 Ways to Hack & Customize the Windows 10 Start Menu The Windows 10 Start Menu combines classic elements with modern tiles. Tiles can add a lot of creative freedom. We'll give you tips and reveal tricks for customizing the entire Start Menu to your preferences. Read More as well, along with any program located on your PC. These are the most basic and useful default changes you can apply to your Start Menu. We recommend populating your Stat Menu with your favorite and most used application, so you can start customizing! Better StartMenu is a popular and highly ranked Start Menu customizing program, which offers easy to use tile customization for your favorite programs. The software comes in two parts: Better StartMenu and StartMenu Helper. The Helper program saves the tile data, including the name, icon, and path of the program, while Better StartMenu adds the tile onto your Start Menu. Although the program lists a cost of $2.99, the trial version has no limitations. When you open the program, a screen pops up with three sections. The first section tells you to download the StartMenu Helper. Clicking on the section will lead you to a website where you can download the Helper application. The Helper application downloads as a zipped file, so unzip the file How to Extract Files From ZIP, RAR, 7z and Other Common Archives How to Extract Files From ZIP, RAR, 7z and Other Common Archives Were you ever faced with a .rar file and wondered how to open it? Fortunately, managing ZIP files and other compressed archives is simple with the right tools. Here is what you need to know. Read More to get started. Double click on the application file located in the folder to open Helper. To create a new tile, select New Tile, then click on the Auto Generate all from a single image button to select an image for your tile. This option will automatically resize the picture; if you would like to use a different icon for different sized tiles, click on the image size and select your image. There are several ways to go about finding pictures for your tile. The easiest way to find large selections of high quality icons is through a website like Flaticons, which provides free downloadable icons packs to use. Note: Different customization software requires different picture formats JPEG, GIF, or PNG? Image Filetypes Explained and Tested JPEG, GIF, or PNG? Image Filetypes Explained and Tested Do you know the differences between JPEGs, GIFs, PNGs, and other image filetypes? Do you know when you should use one instead of the other? Fear not, MakeUseOf explains everything! Read More to function; Better StartMenu requires PNG files to create custom Start Menu tiles. Name the tile whatever you’d like under Other options. You may also add a background color, if you are using an icon with a transparent background, along with adding simple or advanced titles. The Action section will provide a path for your program. The Action Type drop-down menu specifies which type of file or folder you wish to open. This is very convenient if you are, for example, a video editor, who regularly requires access to an external hard drive or raw video folder. The Select entry is where you will link the tile to the path or program you wish to open. The simplest way to link the path, is to use a tile already pinned onto your Start Menu. Access the file path under Start > right-click tile > More > Open file location. Next, Right-click Program > Properties to access the specific file location and copy the Target location. Paste the location into the Select entry of Better StartMenu Helper. Click on Generate tile data and your tile will show up in the Better StartMenu program. After you’ve generated the tile data, open Better StartMenu, click on your newly created tile in the second section and click Pin select tile to Start Menu to add the custom tile to your Start Menu. Finally, position your tile and enjoy your fully functional and fully stylized Start Menu tile. The potentiality of Better StartMenu is endless, so feel free to tinker with the program to create the perfect Start Menu tiles for your PC. One of the best looking functions you can provide for your Start Menu is adding game tiles. The Steam Tile application available in the Windows Store serves this very purpose. The only thing you need to provide for this program is your SteamID. You can access your SteamID by opening Steam > Account Name > Profile > Edit Profile > Custom URL. Add your preferred URL and click Save Changes. Once you have created your Steam ID, enter it into the Steam Tile welcome screen and you can pin your steam games to your Start Menu. The difference between simply adding gaming programs to your Start Menu and using Steam Tiles is stark and impressive. This also allows you gaming access without having to open the Steam library. If you use more than one gaming client, consider Pin More (also available in the Windows Store). Pin More offers the same functionality as Steam Tile, but with a larger range of customization and gaming clients. Using these programs will not only make your Start Menu a program repository, but a gaming command console as well! The tile service offered in Windows 10 conserves the sleekness of Windows 8 tiles, without the overbearing Metro / Modern UI theme. Customization was the only default feature lacking from turning this service into a genuine facet of the Windows 10 experience. 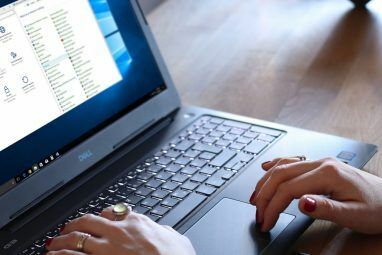 With these programs, you can finally free your Start Menu and take advantage of yet another subtle and dynamic feature present on your PC. How do you customize your Start Menu, and what customization options would you like to see made possible? Let us know in the comments below! Explore more about: Start Menu, Windows 10, Windows Customization. Classic Shell - Problem Solved! What? I'm not living in the past. I love my tiles! Just because something is new doesn't mean it's better. You must be pretty dumb to think that. Just because something is old doesn't mean it's better. You must be pretty dumb to think that. Thank you for the error check, Howard! How'd that get in there? !